The sign says, “New Science Condemns It,” but the reality is Old Science condemned it, too. The Old Science was just brushed under the rug by big industry, money and propaganda. Read Christopher Bryson’s book, The Fluoride Deception for a comprehensive history of fluoridation. In the past few days, two new studies have made headlines questioning the safety of fluoridation – fluoridation contributes to hypothyroidism and to attention deficit hyperactivity disorder (ADHD). A recently published study has found an association between widespread exposure to fluoridated water and increased Attention-Deficit Hyperactivity Disorder (ADHD) prevalence among U.S. children. relationship between exposure to fluoridated water and ADHD prevalence. Science continues to expose fluoridation to be unsafe. Don’t believe the rhetoric flowing from those supporting fluoride espousing science is on their side. Ask them for the studies. This is an excellent letter written by a dentist to the Newburyport News. When a highly intelligent friend asked me to look into fluoridation, I nearly dismissed her request in an automatic response. After all, questioning fluoridation went against my dental school training and much of the news crossing my desk from the ADA. However, since fluoride was the most common prescription I was writing at the time, I decided to take a look into this “sacred cow” of public health policy. Acute exposure to fluoride does harm in obvious and immediate ways. But the small daily dose exposures accumulate in the body over time, building up like arsenic or lead. Ingesting fluoride is like taking in a ticking time bomb. Those who advocate fluoridation simply do not understand the nature of the substance in question or the extent of its harmful effects. I sincerely hope that the citizens who have taken up the cause of ending fluoridation will prevail. Bennington, Vermont – The majority of voters turned out to say “no” to fluoridating the water Tuesday (March 3) at Town Meeting. with.” Brackenridge follows Ford, PA, which voted to end fluoridation in December. When will we see our city added to this list? 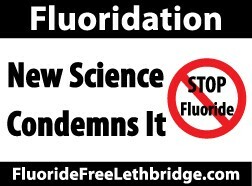 Sad to say, nothing to report on the fluoride fight in Lethbridge. If you know of anything happening, please share with the rest of us. Richard Hudon, an Ottawa fluoride fighter, sent the following letter to his mayor and town council. Something to consider sending our City Council. be implemented until they are done? Failure to do so is a dereliction of duty by authorities, so why go along with them? It is your responsibility as a Councillor to see that additives used in water treatment are safe according to the Ontario Safe drinking Water Act, section 19. Please bring a motion before Council to halt fluoridation, demand a moratorium, until the actual chemical mixture that is used is incontrovertibly proven safe for human consumption by adding it to the community water supply during the water treatment process. Please do not attempt to mollify my assertions and questions by accepting false statements that we would have seen problems with this practice if there was any, because no one has ever monitored or is currently monitoring for adverse reactions from fluoridation in Ottawa; until this is also done, there is no proof that it is not dangerous to human health. It’s your job, it’s your responsibility to look after Ottawa’s residents in this matter, it is neither the Medical officer of Health’s job nor any of his staff, so please do not defer to them on this matter. Please, do not be a sheep, be brave: bring a motion to Council to declare a moratorium on fluoridation. The courtesy of a reasoned and helpful reply is respectfully requested. All the best Richard Hudon, President Safe Water Ottawa Member: Canadians Opposed to Fluoridation – Canadiens Opposés à la Fluoration Fluoride Action Network Worldwide Alliance to End Fluoridation 3755 Loch Garry Rd Apple Hill, Ontario, K0C 1B0 1-613-527-2589 – text only: 613-852-8692 _________________________________Actions speak louder than words. Much is given back to those who give freely.